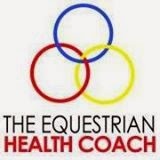 If you want mentors, cheerleaders, gurus, and business colleagues to help you reach your goals, then the Equine Entrepreneur Mastermind is for you. Do you ever feel uncertain about what to do to make your business grow? Do you ever feel lonely as an entrepreneur and wish you had a sounding board for business advice and support? Would you like to receive personal, one on one guidance on how to increase your profits and product/ business presence? 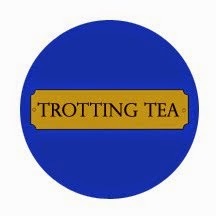 A unique experience from all other groups and memberships on the Internet: we are specifically horse-focused, small business oriented, and maintain a small size so we can focus well on helping each other. Is the Equine Entrepreneur Mastermind right for your business? You are probably aware of a lot of membership sites, courses, and groups that promise you the moon. Maybe you have even joined some and been disappointed with them. We've fallen for them and their shiny marketing too! Most of these groups are NOT applying personal advice for each and every member. Most of them are NOT limiting the number of members to ensure quality attention. Imagine being a part of a Mastermind that provides your business with as much personal attention as you can handle: website reviews, brainstorming sessions, product promotion, and social media advice all just for YOU. Regardless of your business type, if you sell anything equestrian, then a tailored Mastermind membership is essential for your business toolbox. We initially created an equine mastermind to have a safe place where we could have focused and personalized feedback on growing horse businesses. Our members all met and exceeded their business goals! If you're like the vast majority of small business owners that have participated in our Mastermind, you know that no one wants to dedicate weeks, or maybe even months, working hard to build a business that is doomed to fail because it's not based on a viable idea. This is why people can agonize over decisions, go back and forth, doubt themselves, look for more research, and freeze and be stuck in a rut... and in the end, still do absolutely nothing to reach their goals. They're paralyzed by the fear of heading down the wrong path. Some of us in the Mastermind have made many right decisions that have lead to awesome business growth...but without a doubt, many have also made far less successful decisions in their entrepreneurship journey. It is sharing our stories, comparing strategies, and offering a third-party perspective that leads to results and success. That said, there's no need to run recklessly into a business that isn't built on a solid foundation and is therefore doomed to fail. So if you want to be *sure* that the idea you pursue can really support a thriving, successful business, in the Equine Entrepreneur Mastermind we'll provide you with the feedback, advice, and insights we each have gleaned from our own business experience...whether you are starting with just the seed of an idea, or whether you have been working away on your business for several years. If you are seeking growth, but want specific direction then get started by joining the Equine Entrepreneur Mastermind Today. And when you've done that, you'll finally be able to proceed in building your business with the confidence and ease that come from knowing that it's going to succeed. If you have one specific passion that you want to build your horse business around, you'll learn how to focus and position it in a market where it will easily be profitable. And if you have too many passions, you'll learn how to narrow them down and find the one that has the greatest potential, and presents the biggest opportunities. From there, you'll learn how to find your ideal customers, evaluate your competitors, and the perfect way to enter the market. Instead of being stuck in a perpetual state of reluctance and uncertainty, you'll finally be making steady, tangible progress towards creating a real business. Does this sound like exactly what you need? 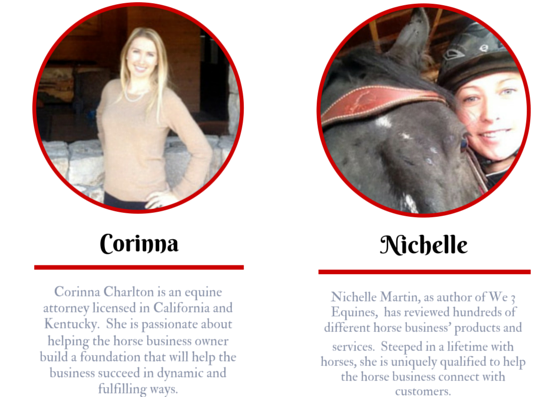 Join our Equine Entrepreneur Mastermind now! Is my business ready for a Mastermind? Can the other equine entrepreneurs really offer assistance to me? Is this group different from the hundreds of other groups out there? Remember that forming joint ventures can make the difference between a few sales here and there, and a business that can reach thousands of people. Our private consultations and group input can help you learn how to choose the partners to work with, using proven strategies for approaching potential partners and cross-promoters of your horse business. 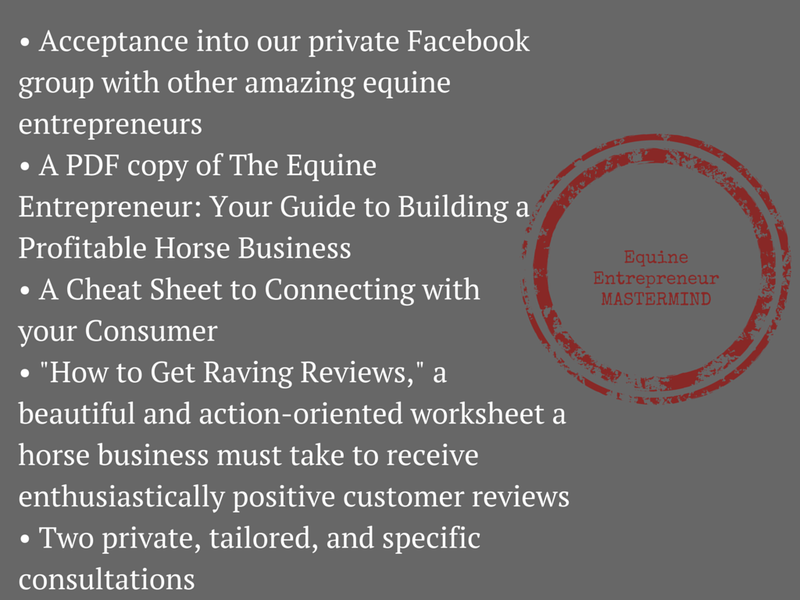 Equine Entrepreneur Mastermind membership is LIMITED! 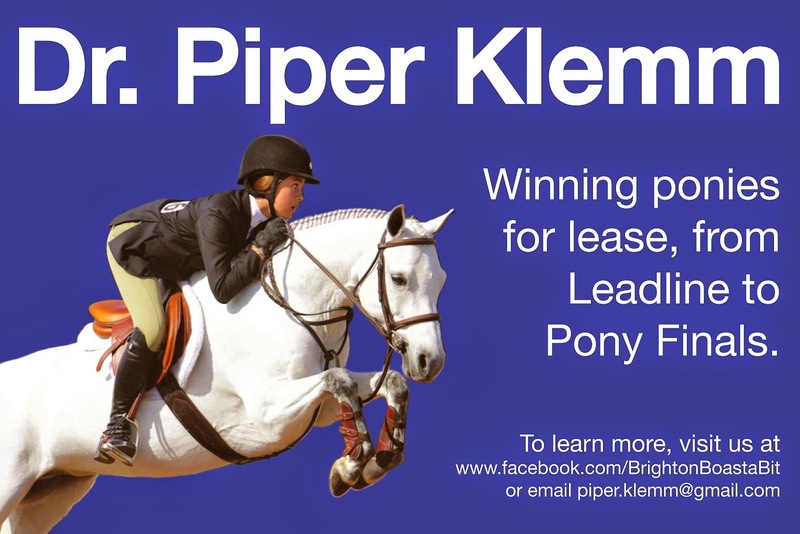 We do this to ensure your horse business receives personal and attentive advice and support. For the remainder of 2014 we are offering a rare discounted price to participate and grow with us. Normally membership is $197, but until January 1, 2015 you can join for a bargain of $97! This is only about $7 per month! For the cost of about two coffees you can be a part of an invigorating group that is focused on helping your sales succeed. Remember, we have to LIMIT the number of Mastermind members to ensure high-quality delivery of networking, advising, and support, so don't hesitate to JOIN NOW AT THE DISCOUNTED RATE OF $97.00! 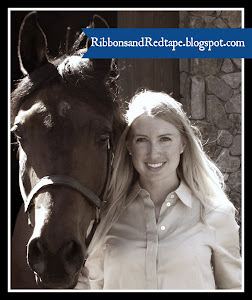 A 20 Minute Private Consultation with Corinna Charlton, equine business attorney, author of Ribbons and Red Tape and "The Equine Entrepreneur: Your Guide to a Profitable Horse Business"
Your membership, with two private consultations and the provided literature and the private support and networking group, is valued at several hundred dollars, but because we want to see your business SUCCEED in 2015 we are offering you a membership at LESS than $100. We are keeping membership limited to a select number of Equine Entrepreneurs who are serious and excited about growing and succeeding. Join Now, membership prices will go back up to $197 on January 1, 2015. Here's to your passionate business and profitable ideas! Terms and Conditions: twelve month membership. Re-purchasing membership will be required 12 months from the time of initial purchase. No results or profit are guaranteed. 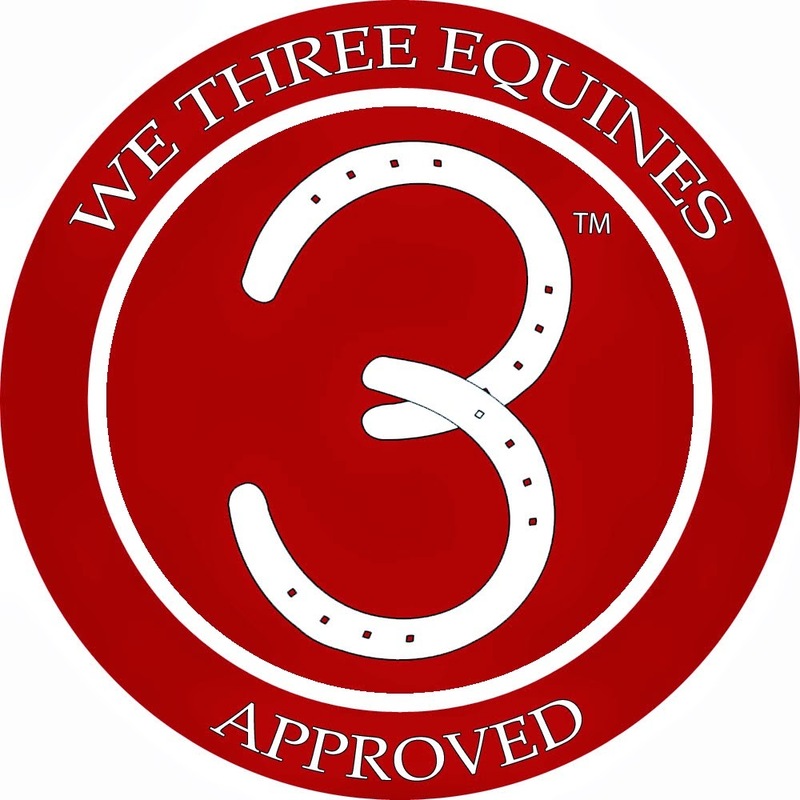 You will not receive legal advice from Corinna Charlton and will be encouraged to see an attorney licensed in your jurisdiction for legal advice for your horse business. To Buy a Horse Business...or to Buy its Assets?